Online: Use Applebee’s coupon code: 5OFF25 at checkout. In Store: Check with your local Applebee’s if 2 for $20 menu is available at participating locations only. Printable Coupon: Sign up for applebee’s email club and print a coupon for a free entree on your birthday. Receive email updates from Applebee’s featuring new menu items, exclusive coupons, special events, and other news when available. In Store: Applebee’s coupons are not available at the moment however they do have a great Father’s Day deal. Tomorrow only (June-18) dine with dad at Applebee’s restaurants and treat him with a meal fit for a king for only $19.99. Includes a 4oz sirloin steak, chicken, half rack of ribs, plus two classic sides. Hmmm! Save more money when you buy these Applebee’s vouchers (Up To 15% Off). Can be printed and redeemed in stores. Buy $50 in gift cards at Applebee’s restaurants and get a $10 bonus card. Visit Applebees today, choose one entree for just $2.49 and get a second entree for free. Not Valid with other coupons or discounts. Bring your kids to Applebees on labor day September-5, they eat free all day..
Mark your calendar. Coupons are not required, Applebee’s is giving away free appetizer samplers on July-21. 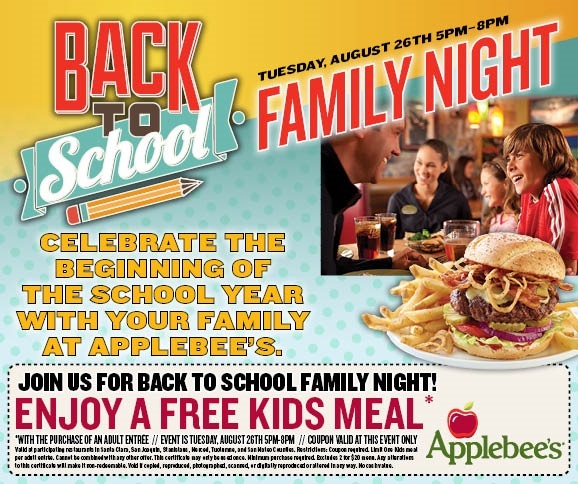 Back To School Family Night.. Free Kids Meal w/purchase of an Adult Entree. Valid 8/26/14 only. At Applebee’s receive a free $10 bonus card when you buy $50 in gift cards. Coupon is not required. See email for more details.